Like most folks in the software development field, we spend a fair bit of our time on the Google Wave team tracking bugs and feature requests. At Google, we use an internal tool for tracking issues, and that tool lets us set some initial info about the bug, choose its status from a set of options, set its priority level, and assign it to a colleague. From there on out, we can append comments to the issue to discuss it further. The tool works well as a way of tracking the status of bugs across many projects and people, but it doesn't work as well for working through bugs quickly, or for having more complex conversations on requests. On the other hand, Google Wave, works really well for collaborative debugging, since you can easily paste code in, attach files, and comment on each other's code, and of course, it works great have for having conversations that diverge into multiple threads. I really wanted a way to have the best of both worlds: the structured input of our tool, plus the collaborative conversations of a wave. So, we worked with a team to create the Issue Tracky extension to do just that. When you install Issue Tracky, you'll see both a new item in your "New Wave" drop down and an icon on your toolbar. You can use the former to create a new issue report from scratch, or you can select text in a wave and click the toolbar icon to turn it into an issue. 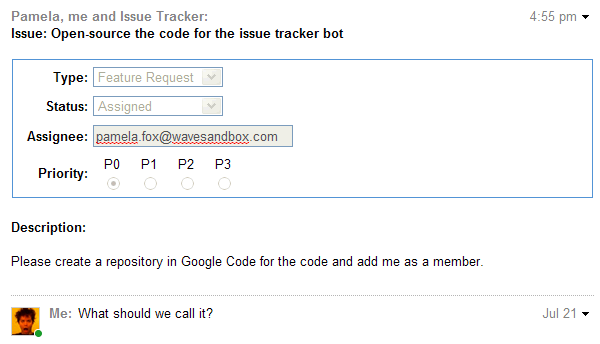 In either case, a robot will fill the wave in with a title and info gadget, where you can pick the issue type, priority level, and assign the issue to a colleague. From there, you can add a description using all the Wave editing tools you're used to, attaching files or pasting formatted code, and then add your colleagues to the wave to discuss the issue. The robot will automatically tag the wave based on the information in the gadget, so that you can create saved searches for all of the bugs assigned to you (e.g. "type-bug assignee-pamelafox") or all of the high priority requests ("type-request priority-1"), and easily browse through them in weekly reviews or triage meetings. We've created a generic version of the Issue Tracky tool that anyone can play with, but we've also open-sourced the code, because we think that this is the kind of extension that companies will want to both use and customize for their own use, perhaps by integrating it with existing systems or changing the gadget to collect different pieces of information. To get started with your own version of it, download the code and follow the instructions in the readme. If you have any questions or want to share how you've extended the codebase, stop by the forum. We hope this helps you have more productive discussions on the issues in your projects, and better collaboration with your teams. Enjoy!